Our 13:1 medium speed post hole digger will get the job done. Revolves at 270 RPM and is very efficient for rocky clay drilling. Features a B&S Vanguard OHV engine with 10-inch pneumatic tires, roll cage, and 13:1 transmission. Auger not included. Ideal for medium to very rocky or hard ground drilling, our 13:1 medium speed post hole digger will get the job done. Revolves at 270 RPM and is very efficient for clay drilling. This digger will increase your drilling productivity and result in cleaner holes. Reaches areas inaccessible to skid-steer loaders. Roll cage prevents damage to manicured lawns. 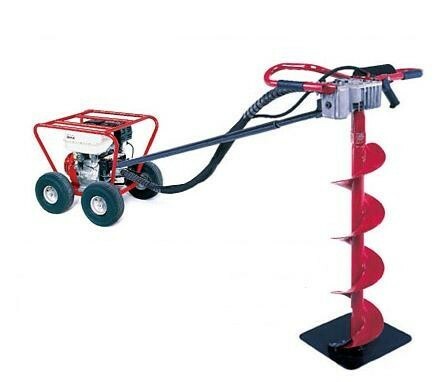 This is a great one-man hole digger for fencing, deck work, landscaping, sign erection, soil sampling and more. 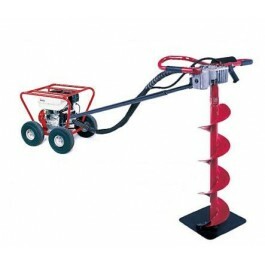 We are pleased to say this auger is a one-of-a-kind mechanical auger digger that will last you a lifetime. Post hole digger features a B&S Vanguard OHV engine with 10-inch pneumatic tires, roll cage, and 13:1 transmission. Auger not included.